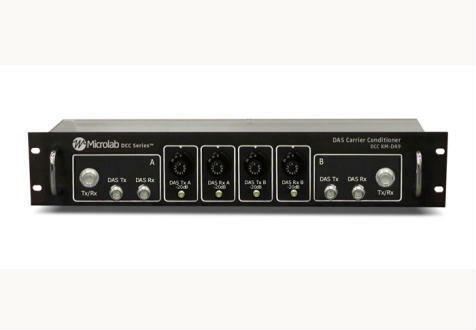 Microlab custom designs DAS Carrier Conditioner that conveniently integrate passive components. A common example is the DAS Carrier Conditioner used at the point of interface between service providers and an In-Building Distributed Antenna system. Requirements commonly include the need to combine signals from public service channels or Tetra usually in the range from 380 to 520 MHz with cellular services extending from LTE 700 to WiMAX/LTE-2600, as well as other services up to 6 GHz. Microlab’s broad range of catalogue diplexers and hybrids allow rapid creation of special configurations to suit customer needs, whether in-building, on trains, in tunnels, in hospitals, etc. To simplify requirements further, Microlab also offers standard designs which offer for example 4 low band and 4 high band inputs combined to 4 identical outputs, which may be distributed to different parts of an in-building project. Such designs are essentially loss-less, greatly simplifying the task of optimizing the loss budget.